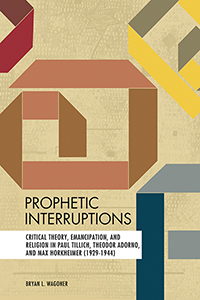 PROPHETIC INTERRUPTIONS initially draws numerous, yet previously unknown, connections between Paul Tillich, Theodor Adorno, and Max Horkheimer during their shared years in Frankfurt and New York, focusing particularly on the years 1929–1944. While Critical Theory was being formulated, Tillich, the teacher and colleague of Adorno and Horkheimer, respectively, was working on his own religious social(ist) theory. Moving beyond this historical background, Wagoner shows how these personal connections evolved and were mutually engaging. Instead of pursuing discernible mutual influence among Tillich, Adorno, and Horkheimer, the book instead demonstrates that their ideas were forged in the crucible of friendship and common purpose, toward the common end of emancipation. The collective ‘prophetic interruptions’ among the three thinkers have a common goal of naming and remediating injustices, and interrupting social forms that inhibit individual and collective agency. To that end, parallels are traced along four lines: critical rationality, theories of human nature (particularly vis-à-vis Nazism), metaphysics, and religion. These striking commonalities (coupled with potentially insurmountable differences, such as ontology) reveal historical connections between progressive religious thought and allegedly secular critical theory. The book suggests room for further conversation between progressive religion and critical theory rooted in Tillich’s early ‘religious socialism,’ read here as a type of critical social theory, anticipating that of Adorno and Horkheimer. The appendix includes the first translation of an important letter from Adorno to Tillich, written in 1944.